"The Adventures of a Girl & Her Dog" picture book series celebrates the bond between girl and dog as they explore the world together. Here creatures can be who they are, they can chase what they chase. And a girl and her dog are just a small dot in space. Each year Dagny McKinley hikes over 1,500 miles with her dog, Alma Rose. They have visited the ocean, the mountains, canyons and every landscape in between. The joy McKinley feels when she is surrounded by nature with her best friend led to her write The Adventures of a Girl & Her Dog book series. 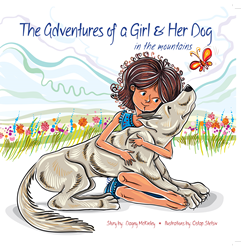 This picture books illustrate the bond between a girl and her dog as well as the freedom and healing that nature can bring to people. “The wilderness is ageless, timeless and sometimes ruthless. I can only compare being out there with the wonder of experiencing life as a child,” said McKinley. By getting out every day with her dog, McKinley has encountered more sunsets and sunrises than she can count and has been able to witness bear, moose, elk, deer, fox, pine marten, countless birds and even a mountain lion. “Seeing a mountain lion loping down a trail towards you at dawn makes you feel alive in a way very few other things do,” said McKinley. McKinley looks forward to those quiet moments where there are no other people on the trail and she can get lost in the moon and stars or the line between night and day when color begins to flood the world. As a child, McKinley’s parents took her on long walks. During each outing, McKinley complained of sore feet and hated the feeling of being left behind because she walked slowly, yet a seed was planted that led to a love of hiking and camping later on in life. McKinley understands how lucky she is to experience nature on her own terms. In nature creatures can “be who they are and chase what they chase. Where a girl and her dog are just a small dot in space,” The Adventures of a Girl & Her Dog: in the mountains. She hopes parents will read the books to their children and, as they do so, remember that they, too, can be young again, can be filled with wonder and awe. Moreover she hopes the book will plant the seed that girls have a home in nature. “The more we immerse ourselves in the natural world around us, the more it becomes part of us and the more we understand who we are and our connection to other beings on this planet,” said McKinley. ABOUT: Dagny McKinley has lived many places, but found a home in the expansive granite landscape of the Sierra Nevada mountain range. She volunteered as a backcountry ranger for the National Park Service in a remote area of Yosemite. She later worked for three years as a dog sled tour guide in Steamboat Springs, CO. She has an MFA in creative writing. She is the author of six books and numerous articles. She believes all lives are interconnected and each person, landscape and insect has something to offer and teach. She found healing through writing and nature and continues immerse herself in those passions today.